Values shape a company. Our company has thrived as a result of the strict ethos installed in the business by its founders – and our employees continue to drive our success today. Our services and solutions to the challenges of our clients have made us one of London’s leading commercial and residential cleaning companies. Our system of values and our strategy provide us with a framework for profitable, sustainable growth and guide the actions of all our employees. We’re committed to acting responsibly in everything we do. For our clients, we’re a reliable partner. For our employees, we’re an attractive, long-term employer. Not only do we act in accordance with the highest professional and ethical standards; we also demand that our business partners, suppliers and other stakeholders meet these standards as well. We also recognise our responsibilities to the environment and take every possible step to mitigate our impact. 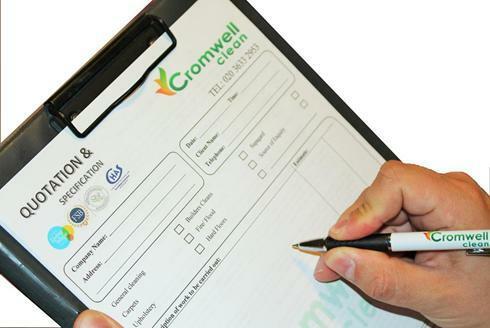 The objective of Cromwell Clean is to deliver Premium cleaning services of the highest quality, appropriate to meeting the growing needs and expectations of our customers, as well as meeting any statutory and regulatory requirements. Excellence entails defining a path of continuous improvement, constantly challenging existing processes and quickly seizing new business opportunities. Excellence also means attracting the most talented individuals on the market and giving them the skills and opportunities they need in order to excel. The need to listen to our clients runs very deep at Cromwell Clean. We do so as a vital means of continuously improving the products and services delivered to our clients. We are always seeking ways to develop, implement and improve the effectiveness of our quality Management System. We take pride in our cleaning services to Customers and strive to provide them with the maximum confidence in dealing with Cromwell Clean.